But until then, Henry, let's not give up the Ghost just yet :) All the punz!!! 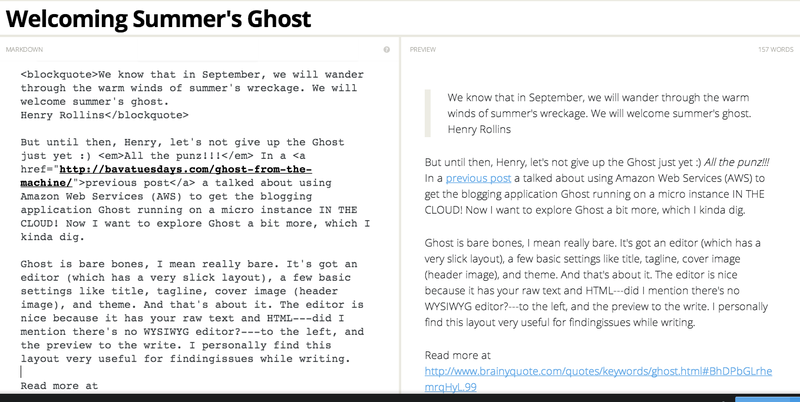 In a previous post a talked about using Amazon Web Services (AWS) to get the blogging application Ghost running on a micro instance IN THE CLOUD! Now I want to explore Ghost a bit more, which I kinda dig. Ghost is bare bones, I mean really bare. It's got an editor (which has a very slick layout), a few basic settings like title, tagline, cover image (header image), and theme. And that's about it. The editor is nice because it has the raw text and HTML---did I mention there's no WYSIWYG editor?---to the left, and a preview of the published post to the right. I find this layout very useful for finding issues with formatting, spelling, and grammar while writing. That said, learning how to edit the config.js file was useful regardless because it forxed me to figure out how to SFTP into the Amazon micro instance Ghost is running on. I found a tutorial on the Bitnami site about connecting to your Amazon Instance via SFTP, it was just what I needed. I used the instructions based on the FTP application Filezilla, but the one thing that stumped me was the PPK file thing. What the hell is a PPK file? Acronyms will be the death of anyone knowing anything! Luckily, this site gave me enough of a definition to figure it out, and I then searched how I convert the Amazon Key Pair* (extension .PEM) to a PPK file so I can use it with Filezilla. Turns out you don't need to convert the PEM file to a PPK file cause Filezilla will do that for you---nice!, I think. So, while I didn't actually fix the URL issue I was SFTPing into to get access to the config file for Ghost, I did learn how to SFTP into an Amazon instance, and I'm digging that. There is a lot more to be done, I think I tackle manually setting up email notifications next, time to experiment with mail servers IN THE CLOUD next. *This whole Key pair encryption is a whole new concept for me, and I'm glad Tim and Ryan told me to pay attention to the explanation during the AWS webinar.